It’s weird but although I have lived in Brussels since 2004 I always have a double feeling about this city: from one side I feel like a “bruxelloise”, a real citizen of a city that welcomed me in the best way; on the other side I still feel like an eternal tourist, since, despite my longtime staying, this city has still the power to astonish me, I have the feeling that I still have a lot of things to discover. But in this post I will stick to the basics, I guess as traveler you don’t have a lot of time to explore deeply, therefore I will just give you a hint on the most popular attractions of the city. 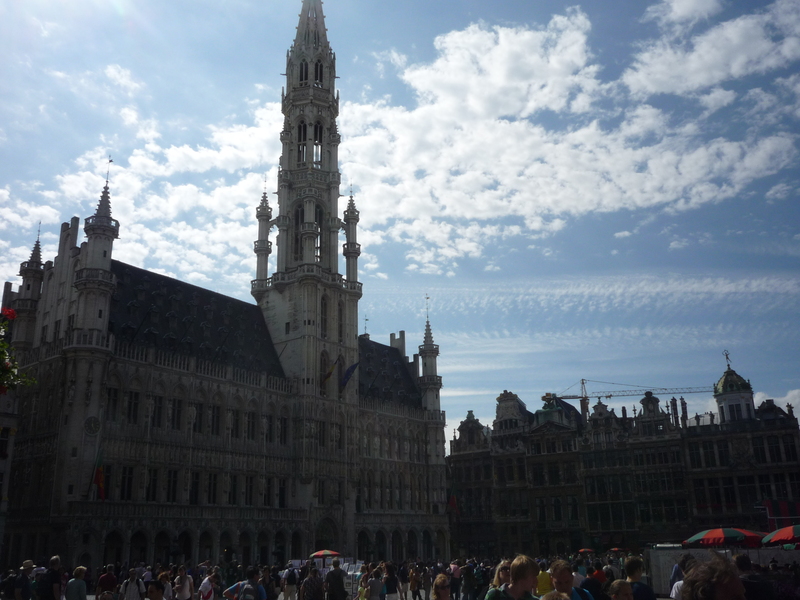 The first day is dedicated to the city center of Brussels, the historical area. 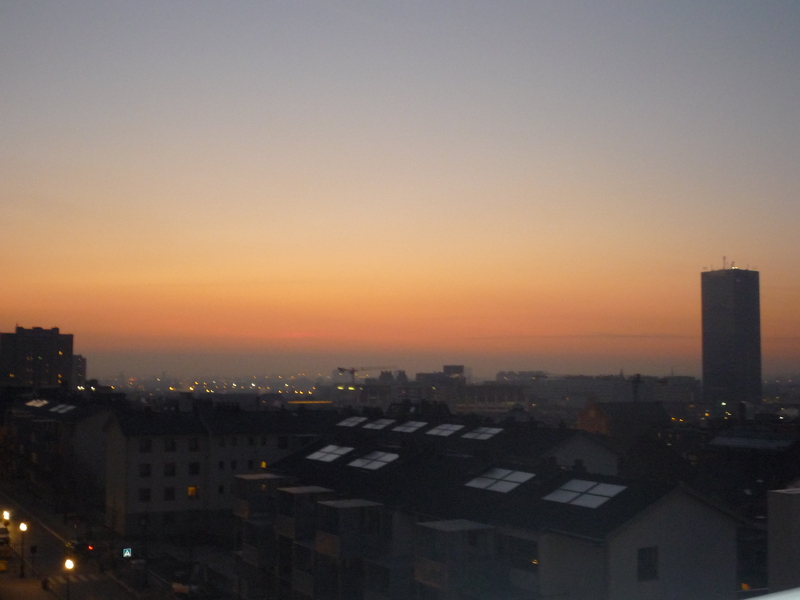 Since there will be a lot of things to see I would suggest an early wake up, a good breakfast (maybe with a Belgian waffle, in order to start tasting the Belgian specialties) to charge your batteries and out for the first visit of the city! For a capital city, Brussels is relatively small, especially the city centre, therefore you can do everything on foot; nevertheless, I will also mention the closest metro stop for each area (in case you’re too lazy to walk or in case you might run into a rainy day – quite typical over here!) . 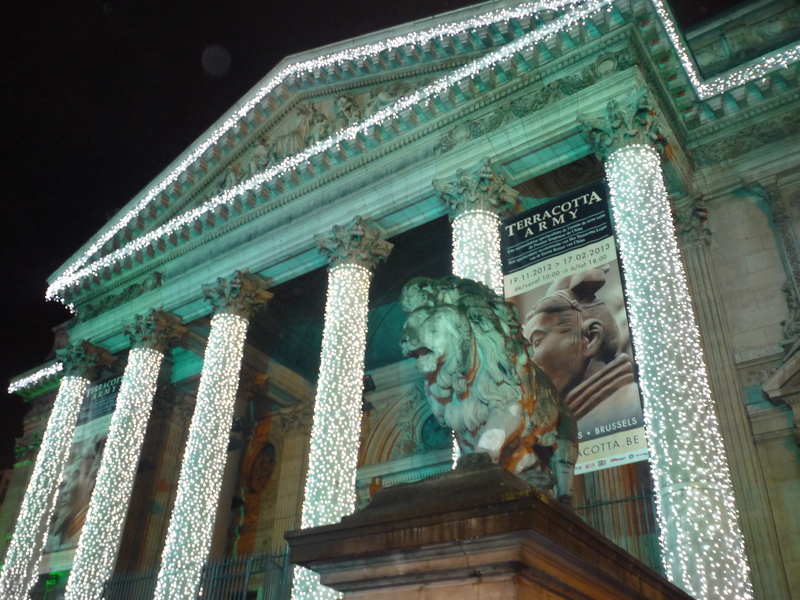 You can start your visit from the meeting point of Brussels: La Bourse. 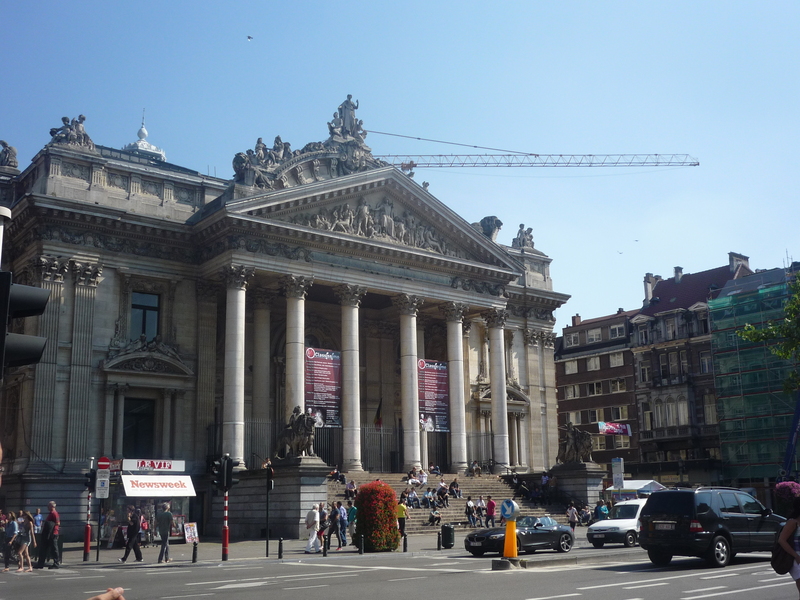 This is the Brussels Stock Exchange and it consists of a big elegant classical building. The Stock Exchange faces one of the main boulevards in the center (Boulevard Anspach) and is considered one of the main meeting points of the city. 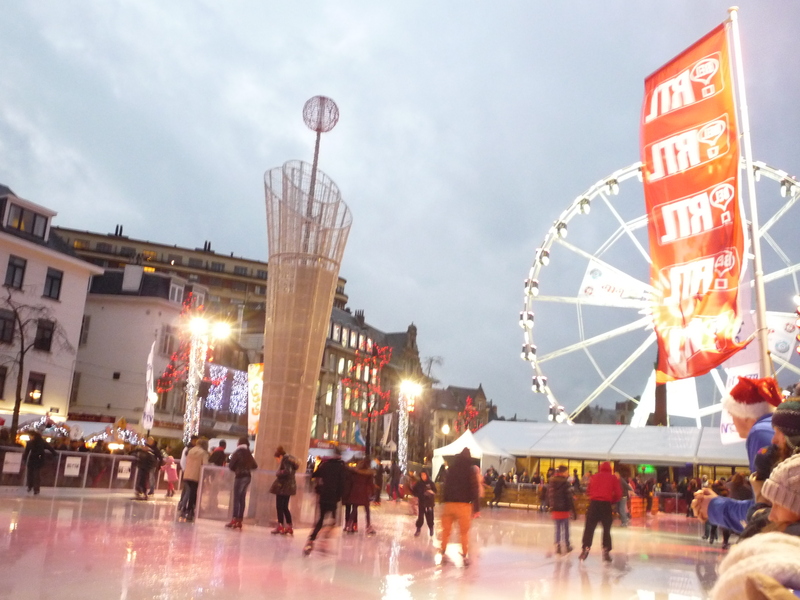 Take the street opposite to La Bourse (the one next to Pizza Hut and Mc Donald’s) and, after passing through the small Chinatown of Brussels, you will get to Place St Catherine. This is one of the most elegant squares in the city, decorated by big fountains. All around are delicious and classy fish restaurants (quite expensive, but definitely worth) and the great St Catherine Church. The streets nearby are filled with historical buildings, cafes, and local designers’ stores. 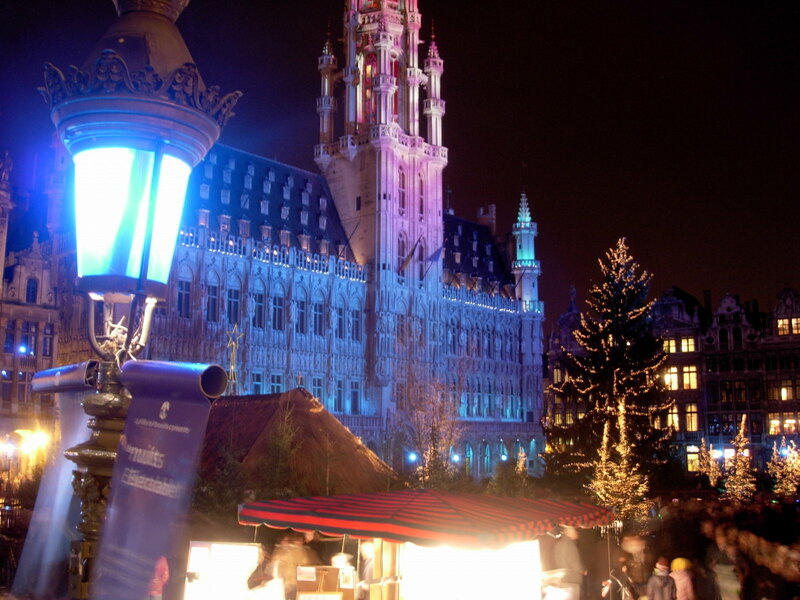 Place St Catherine hosts a fantastic Christmas market every year during the month of December. 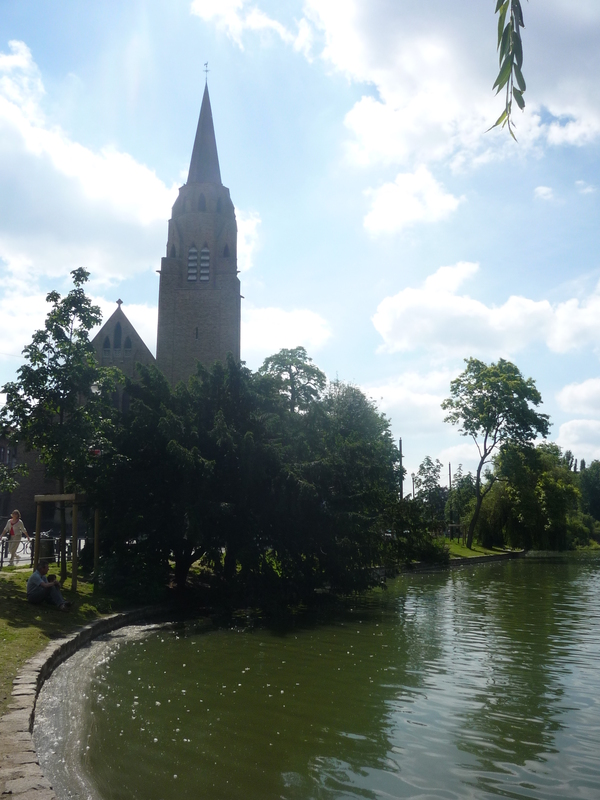 On the right way from the church, you will arrive at Place De Brouckère. Differently from Place St Catherine, this is a modern square (not even a proper square, but a sort of big crossroad, let’s say the very poor cousin of Times Square in New York) with a large walkway and some shops, offices, cinemas and restaurants. 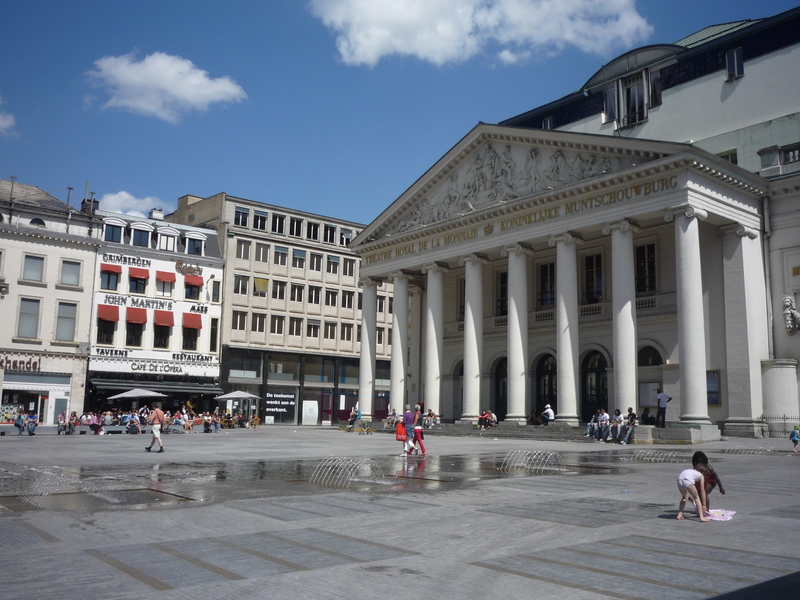 On one side of Place de la Monnaie is the beginning of Rue Neuve, the commercial street of Brussels. This is the street where the worldwide-known brands have their store. Honestly, I would not suggest you to go there unless you have some time to kill: the stores are exactly the same that you can find in every single city (H&M, Zara, Mango, etc), so is it really worth spending hours over there? If you follow my advice and leave Rue Neuve behind, take the opposite way and after less than 5mins you will find yourself in Grand’Place. This is the main square of the city, a real jewel, a place that still gives me emotions every time I see it. This huge square, considered part of the UNESCO World Heritage and elected one of the most beautiful squares in the world, is a concentrate of history and magnificent architecture. 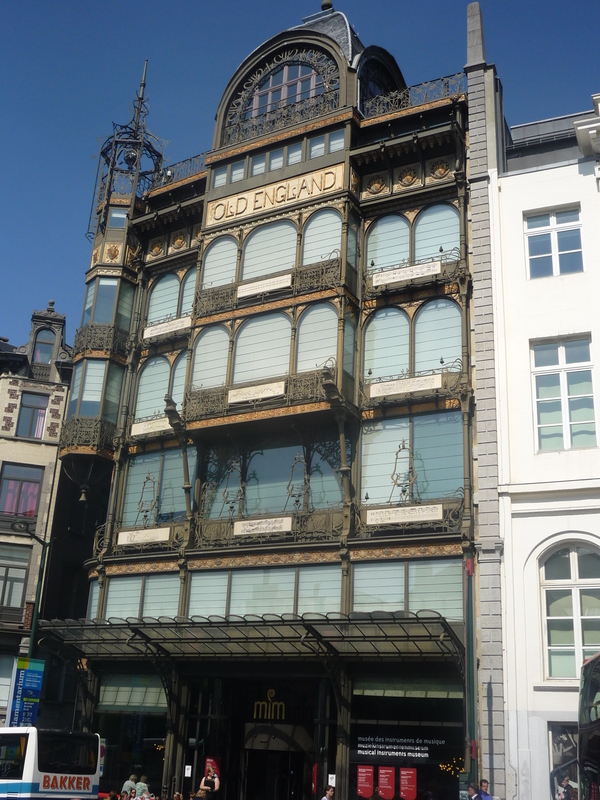 Amazing buildings create the perimeter of the Grand’Place, each of them built by one of the corporations who contributed to the richness of the city (bakers, butchers, carpenters, brewers, tailors, painters, etc), or houses lived by the city bourgeoisie. Three main buildings particularly catch your eyes: the Maison du Roi (a big Gothic building previously used to sell the bread and that nowadays hosts a museum on the history of the city and an entire floor of statues of the Manneken Pis dressed in several historical clothes), the Maison des Ducs de Brabant (a classical complex of 7 buildings externally decorated with statues of the Dukes of Brabant and with gold-color columns; a part of this building hosts nowadays the Chocolate Museum) and finally the Hotel de Ville (Brussels Town Hall, certainly the most beautiful and ancient building in the square; built in Gothic style, the big building starts with a big door entrance and ends up with a high tower hosting St Michel killing the dragon at its top. The asymmetry between the center of the tower and the center of the door apparently destroyed the architecture, who killed himself after having found out this mistake). 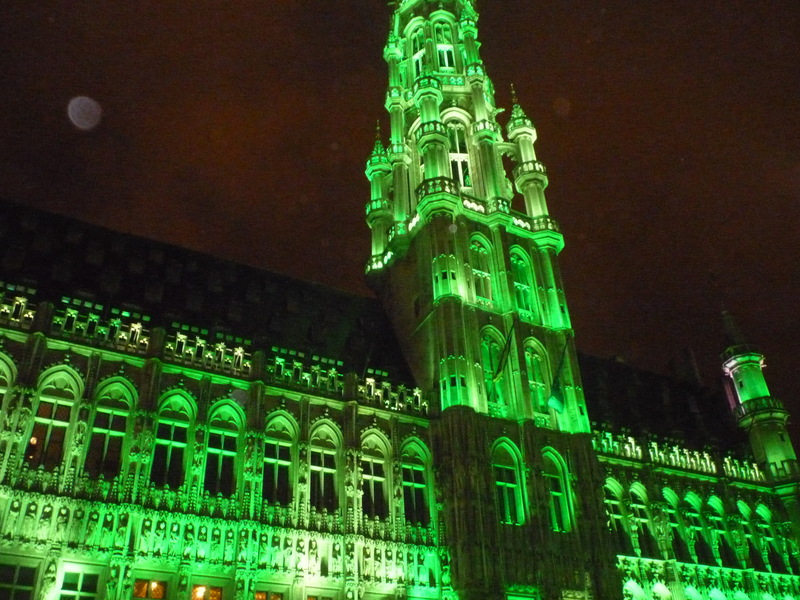 Grand’Place hosts many important events throughout the year: at Christmas time, it has wonderful Christmas decoration and a game of music and lights projected to the square’s main buildings; every 2 years in August, during one week, it hosts an amazing flower carpet. Next to the Hotel de Ville, taking Charles Buls street, you will run into a statue of a dead man, symbol of the sacrifice of the fights between the city corporations. The tradition says that if you touch the body of the statue it will bring you good luck. Keep on going through Charles Buls street, a nice street plenty of souvenir shops, and after few minutes you will arrive in front of the main symbol of Brussels: the Manneken Pis. Those who imagine a huge-size symbol like the Statue of Liberty or the Eiffel Tower will be surprised to find themselves in front of a tiny statue, as tiny as a real kid. 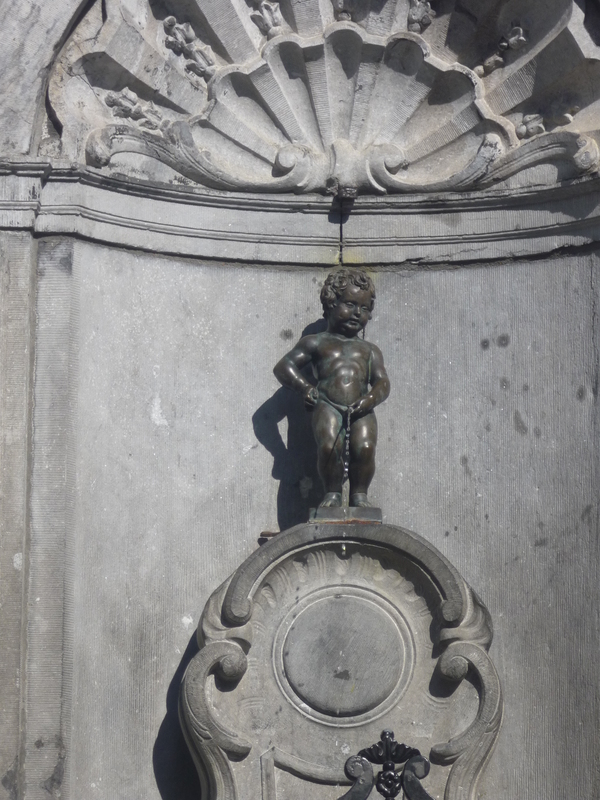 And yes, this is the symbol of the city, a baby who pees! There are numerous legends about the origin of this statue, my favorite one is the story of a kid who, by peeing on a bomb, switched it off and saved the city… compared to the others it’s a more heroic story, so let’s stick to this one! Although being a baby, the Manneken Pis owns a wardrobe that will put any shopaholic in complete shame: 883 clothes offered from historical leaders from all over the world! So if you’re lucky during your visit you might see the Manneken Pis dressed with one of those fancy clothes. 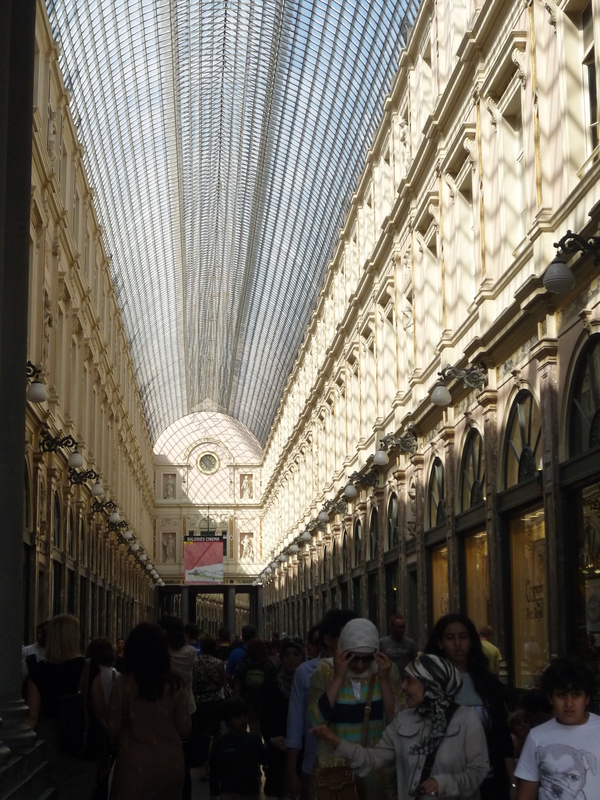 You can have your lunch break in the centre, there are plenty of snacks and restaurants around Grand’Place and Bourse, according to your preference. Once you finish lunch, you can continue your visit. Now, go back to Grand’Place and take the small streets on the opposite way (the ones next to Godiva and Maison du Roi) and you will arrive in Place de l’Agora, a very small but charming square hosting a small market every weekend. From Place de l’Agora, you can take Galéries de la Reine, a very elegant gallery with classy shops inside. 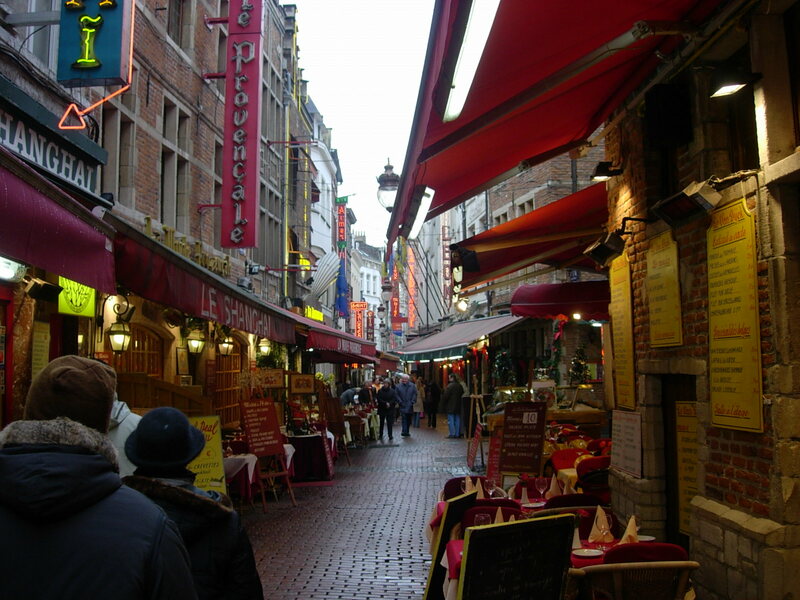 The gallery will take you to rue des Bouchers, a small street plenty of touristic restaurants. 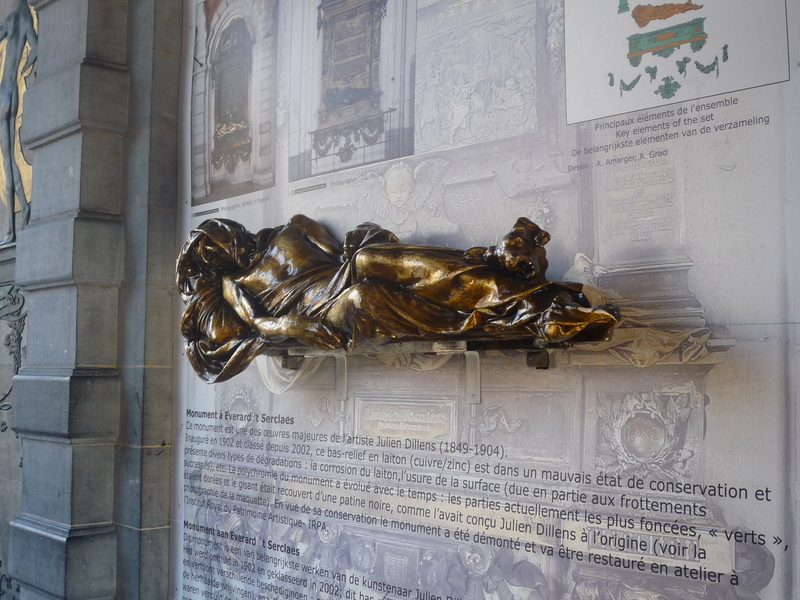 At the end of the gallery, turn right and after 2mins you will see the Saint Michel and Sainte Gudule Cathedral. 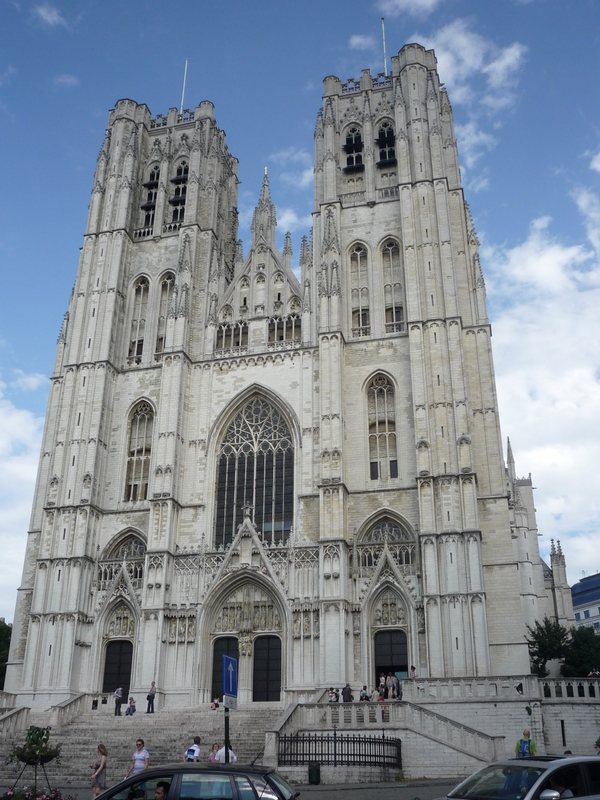 This is the main city cathedral, where the officials religious celebrations take place (e.g. the Royal Family’s weddings). 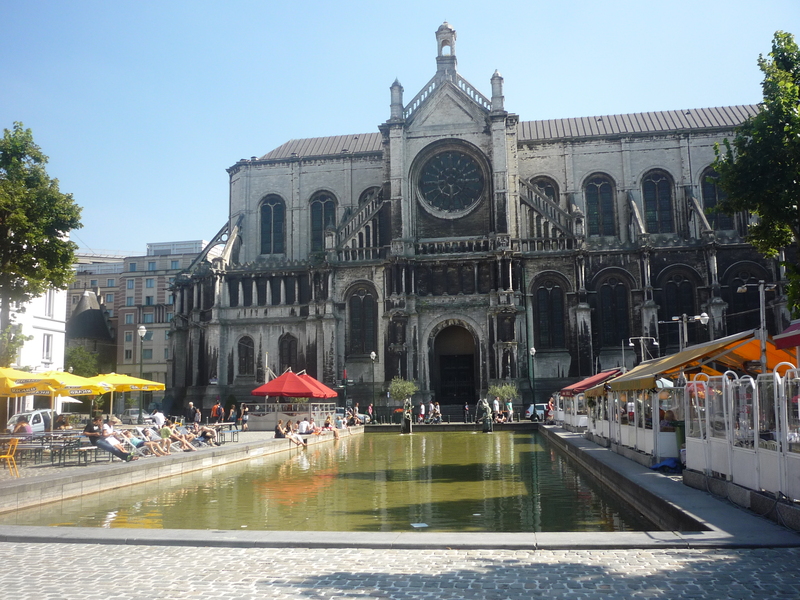 On one side of the Cathedral is the Gare Centrale (Brussels Central Railway Station). 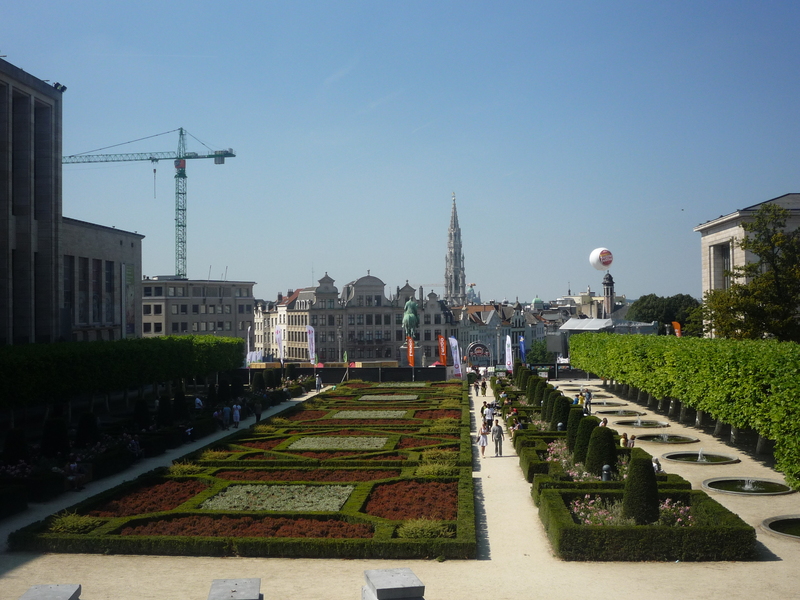 From there take the street behind and climb the stairs in Place de l’Albertine to find yourself in Mont des Arts. 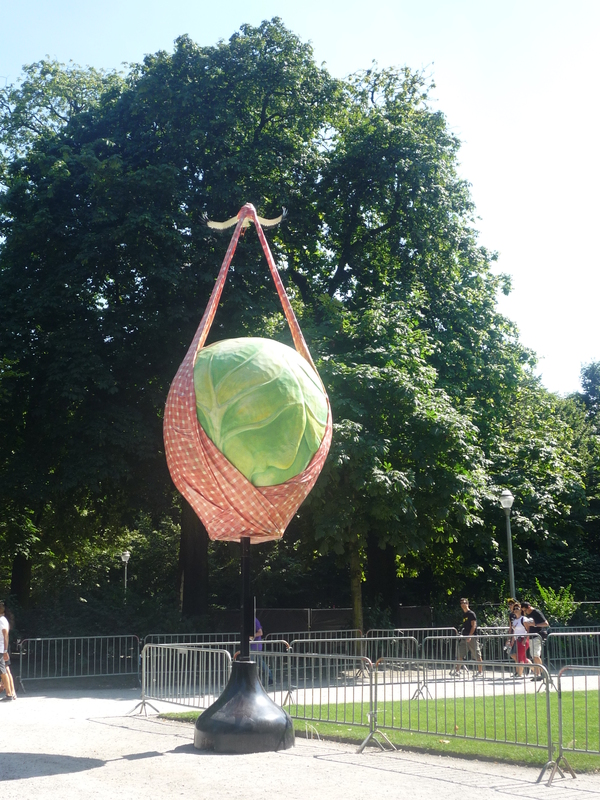 This is one of the most interesting area in Brussels, since it’s the place where the main museums of the city are. In fact, you can find there the amazing Musical Instruments Museum (an impressive Art Nouveau building, designed by Horta, hosting a huge collection of musical instruments from all over the world; on the top of the building is a restaurant where you can admire the city’s skyline), the Magritte Museum ( a nice museum dedicated to René Magritte) , the Fine Arts Museum (the main museum of the city, hosting masterpieces of Belgian and foreign worldwide known artists) and Bozar (the area dedicated to temporary exhibitions). The visit of this museums might take the entire day, so for the first day I suggest you to skip them and go there later on (day 2 or day 3). Next to Bozar is the Royal Palace. 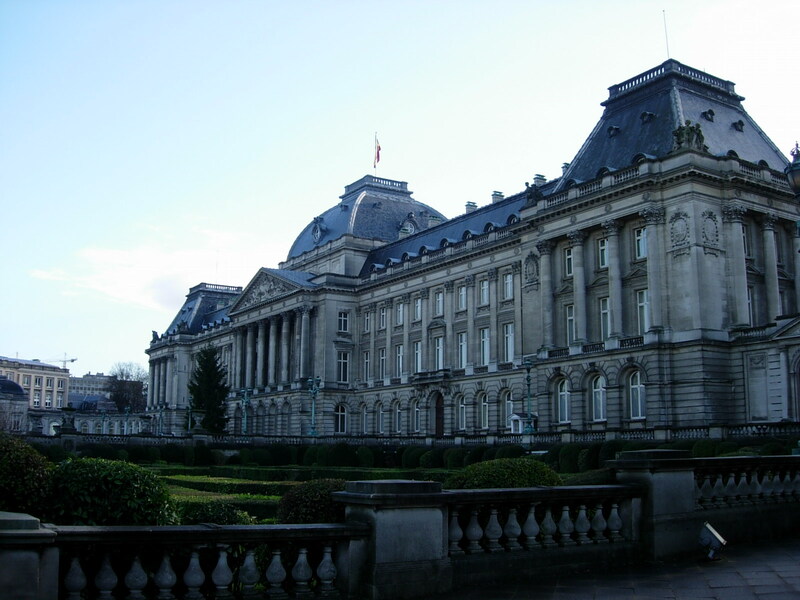 Even if it’s not the current residence of the Belgian Royal Family, this palace is the “official” building, where the Royal Family covers its activities. If the Belgian flag on the roof is up it means that the Royal Family is at the moment in the Belgian Territory. The palace is not accessible, except in August, where visitors can access some of the luxurious rooms. In front of the Royal Palace is the Royal Park, a green and relaxing spot in the heart of the city, good to jog or have a picnic. Go back to the Fine Arts Museum and follow Rue Royale, at some point you will arrive to Place du Petit Sablon and Place du Grand Sablon. 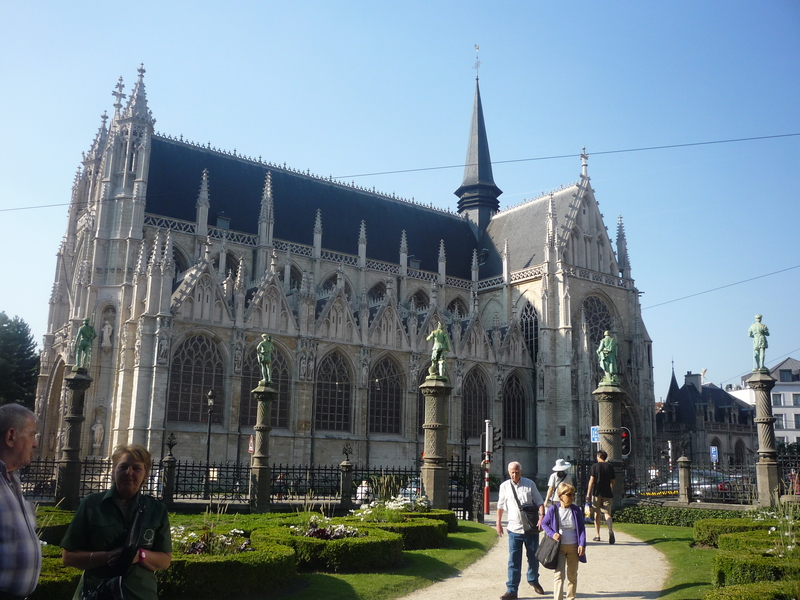 This is a very special area, starting with the fantastic Gothic-style Church of Sablon (try to go inside when it starts getting dark, the effect that the few lights make on the golden areas of the altar is very nice!) and ending with antique and artisan shops, extremely overpriced but very nice to see. 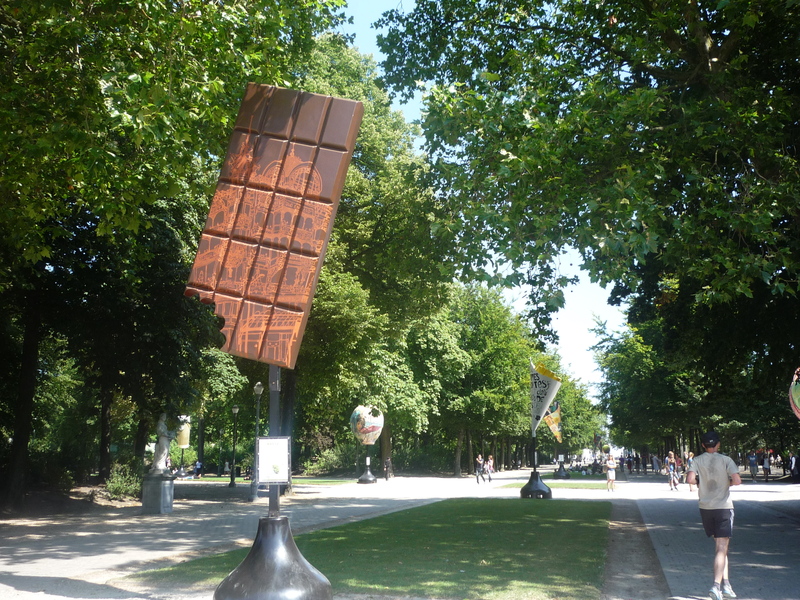 All the most expensive chocolate shops, art galleries, restaurants and jewelries are there. The square hosts also an antique market during the weekends. Taking the way down from Sablon (from Rue Stevens) you will arrive on your left to Marolles area. This area, developed around Rue Haute and Rue Blaes, is not touristic at all, and most known as the hipster corner. You can find there several vintage shops, cafes, and a great daily flea market in Place Jeu de Balle. At the halfway of Rue Haute you will find a big elevator. Take it and you will arrive in Place Poelart. The first thing that will catch your eyes is the Justice Palace, a huge Fascist architecture horror (at least for me it’s a horror!) built in so huge size to symbolize the big importance of the justice. However, this is not the most impressive thing that you will see in Place Poelart, what is much much much better is the view of the city that you can have from there. Indeed, Place Poelart is a balcony on the city, if you stick to the planning you should be there during the sunset and at that moment of the day the view is stunning! A very small parenthesis, but not irrelevant. 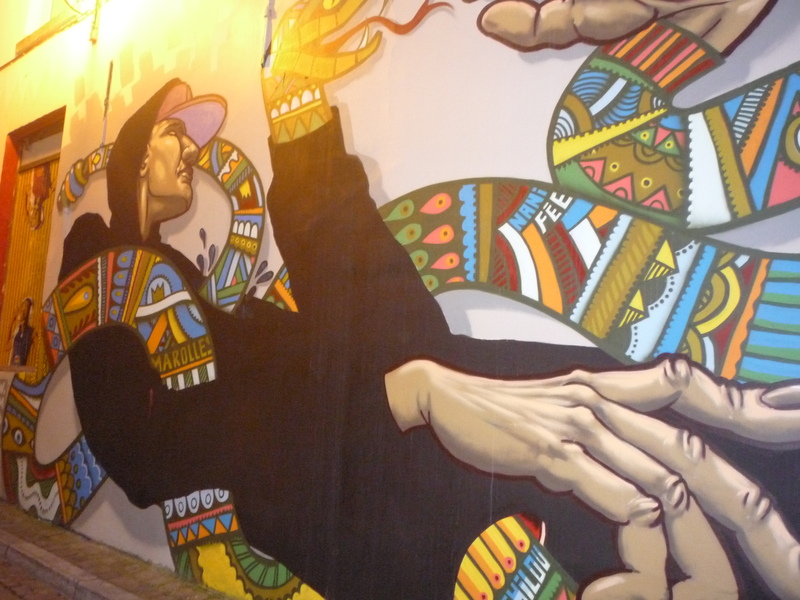 During your exploration of the city you may have noticed some frescoes in the building displaying comic strips image. 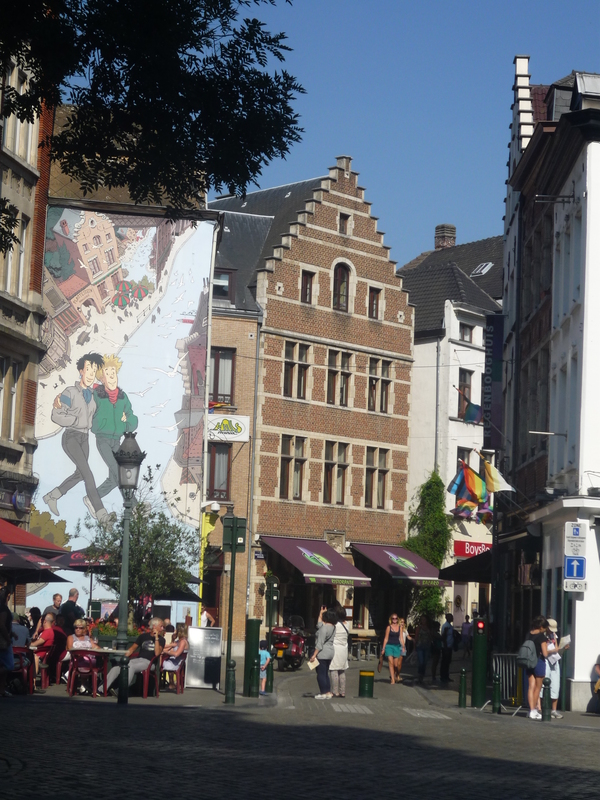 Belgium is indeed the hometown of comic strips, many famous ones come from here (e.g. 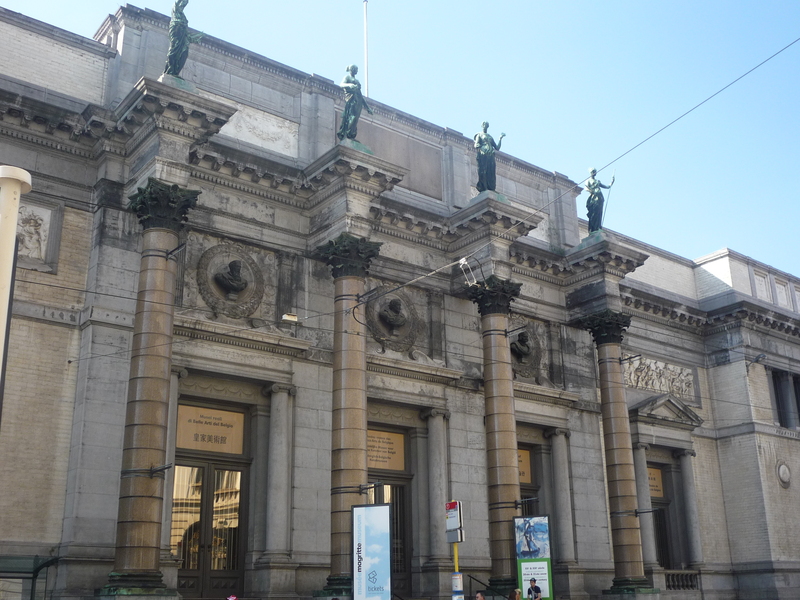 the Smurfs, Tintin, Lucky Luke) and there is also a museum dedicated to them (just next to the Central Station). So the city of Brussels honors all these characters through the several frescoes spread in the city. There is also a special trail to discover all of them, if you are interested in it, check this website. Place Poelart marks the beginning of Avenue Louise, but we will visit that area on day 2. I think for day 1 you have already seen enough and now you can go back to the hotel, take a rest and get ready for Brussels nightlife. Compared to nightlife in other capital cities – such as Paris or London – the one in Brussels is more quiet but not boring at all! You can choose to spend your night in different areas of the city and do several activities, such as dinner, dancing, drinking, concerts, theater. For the 1st day, you may want to stay in the center: in this case you can have dinner in one of the numerous restaurants (maybe you can taste something Belgian for the first day?) and have a drink in Place St Gery (a small spot plenty of bars where young people meet during the night) or have a drink in the Village (the gay area of the city that during the night is filled with people, music and good drinks). The second day in Brussels can be taken more easily. This time we will go out of the center to see other important attractions of the city. 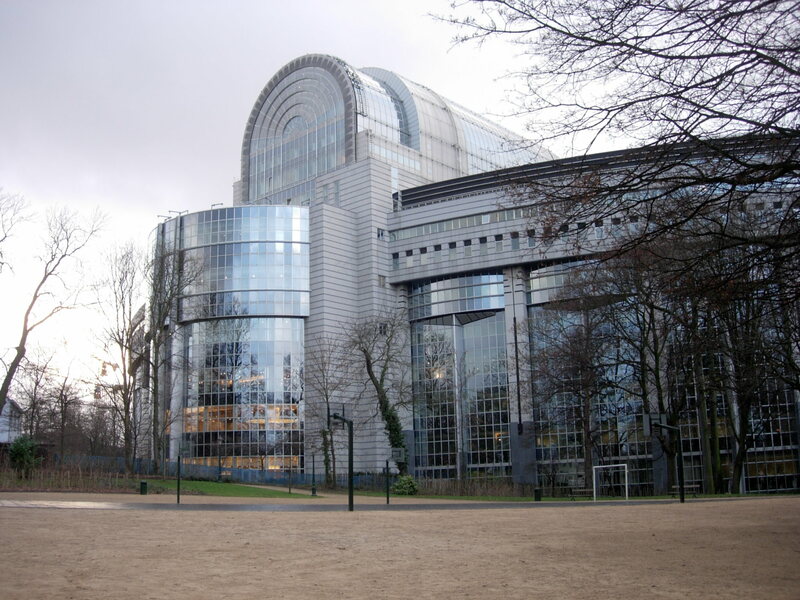 We can start our trip from the European Institutions, namely the European Parliament and the European Commission. As you know, Brussels is the Headquarter of the European Union, so seeing these buildings is a must. Unfortunately you are not allowed to get inside, but you can see the exterior of these two contemporary buildings. 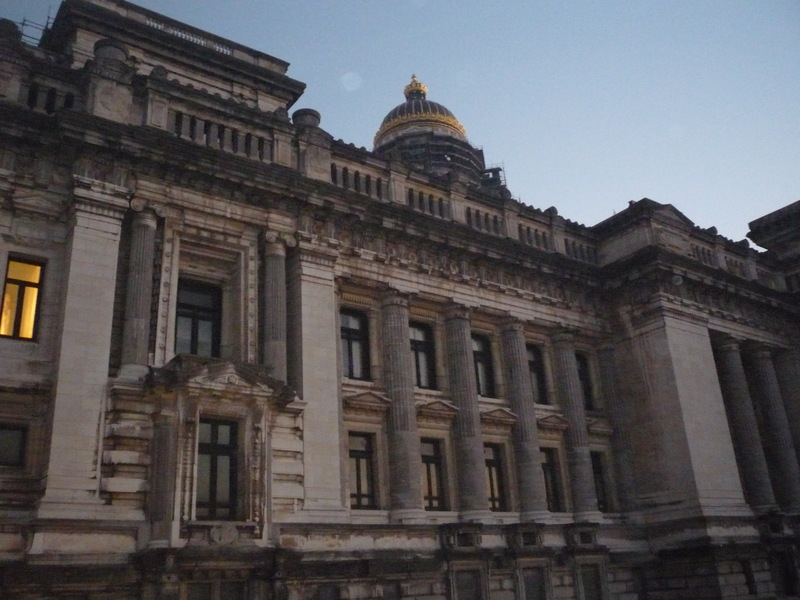 After the European Commission building, at 3 mins walking, you will arrive at Parc du Cinquantenaire. 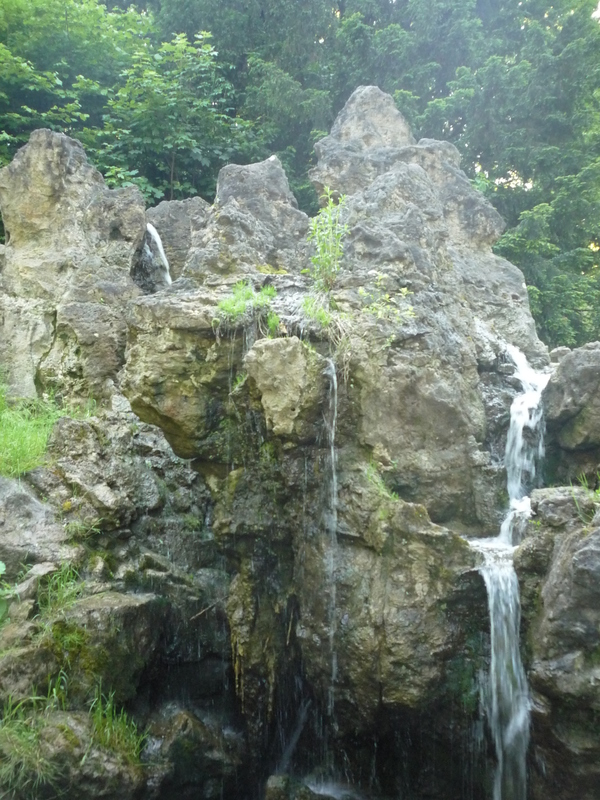 This very big park, that gets overcrowded during summer days, includes a Triumphal Arch in the middle and hosts the Military Museum, the Art and History Museum and Autoworld. I would suggest you to visit at least one of these places (my favorite one is the Art and History one), it will take you around 1h30m. Once you are out of this park, you will have to leave the area and move to the Expo one. This is located on the Northern-West side of the city and it’s the area that developed during the Universal Expo in 1958. 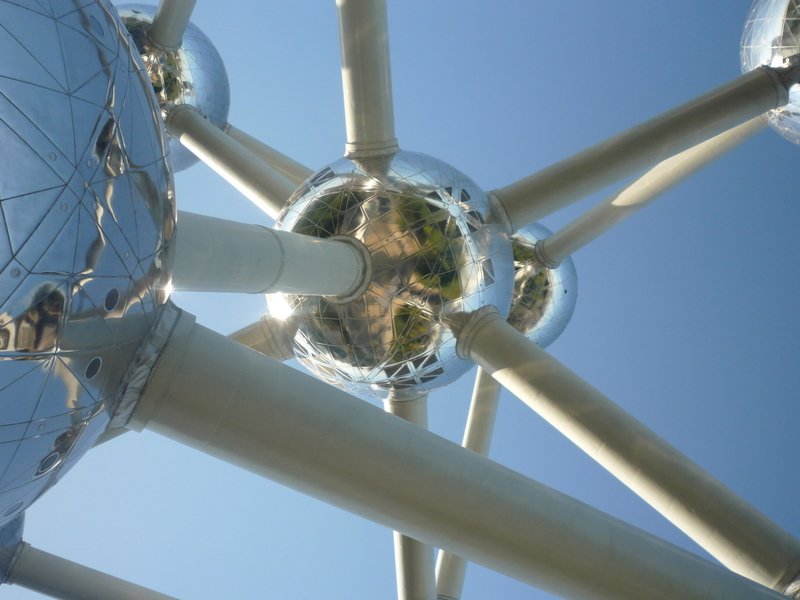 There you can find a lot of places of interest, such as the Heyzel stadium, the Brussels Expo, but most of all you will find one of the main symbol of Brussels: the Atomium. This building, one of the most bizarre in Europe, consists of a18m diameter stainless steel clad spheres that are connected in a way to form the shape of a unit cell of an iron crystal. The spheres are connected through lifts (apparently the fastest ones in the world) and each sphere hosts exhibit halls and other public spaces. 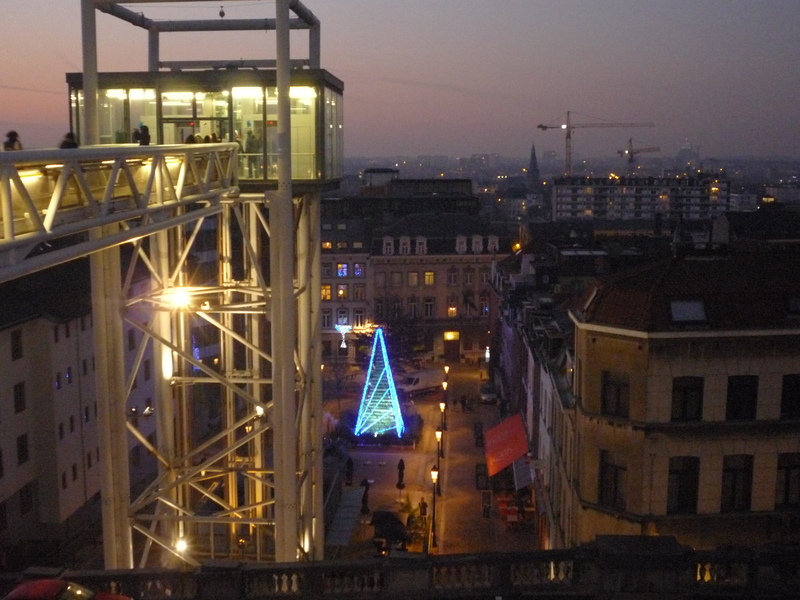 The top sphere includes a restaurant with an amazing panoramic view of Brussels. 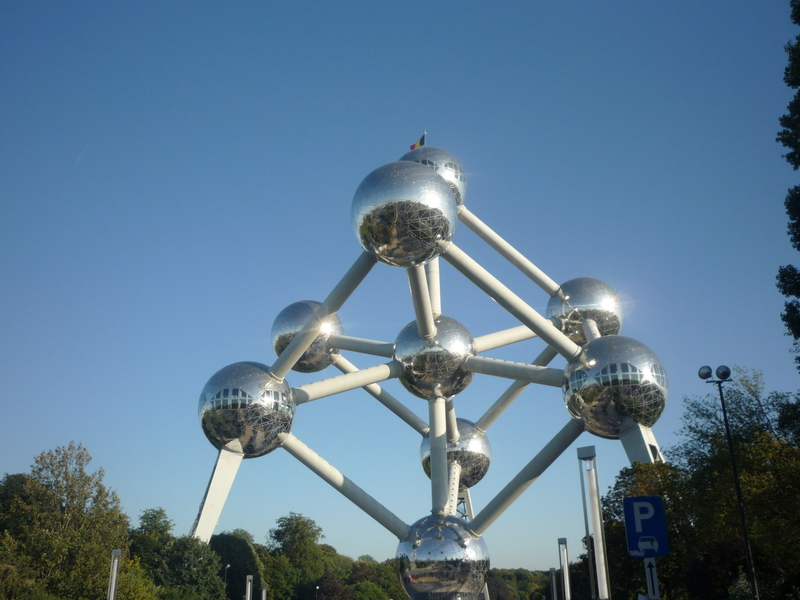 Next to the Atomium are other nice attractions, namely MiniEurope, the Planetarium and a nice court with a lot of restaurants where you can have lunch. After lunch, you can take the metro back and return to the city. Next stop is the poor cousin of the Champs Elysées: Avenue Louise. This is a very large street plenty of upscale stores, most of them ridiculously overpriced. If you want to do some shopping you can stop over there, otherwise we will use this place just as departure point for a more artistic insight. 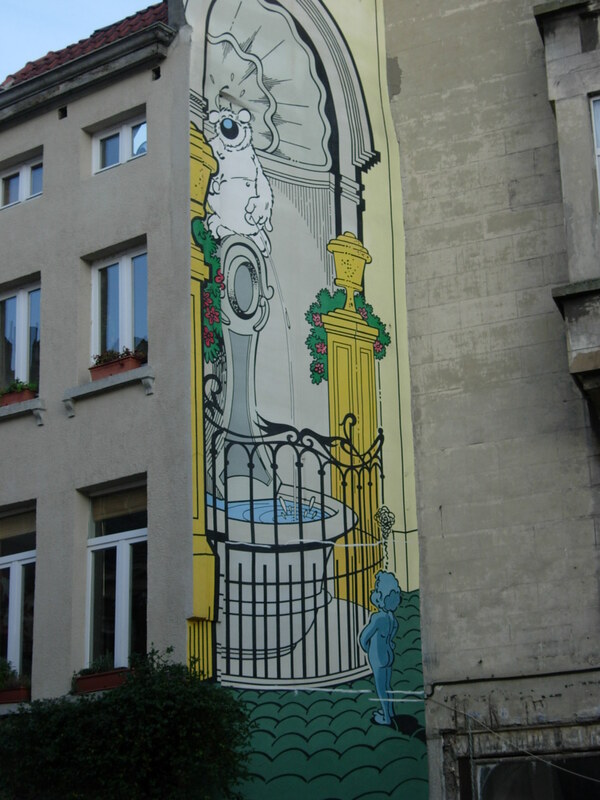 In fact, from Avenue Louise you can easily reach the Art Nouveau district. You can start from Horta Museum. This was the residence of this great Art Nouveau architecture and is nowadays a museum dedicated to his life and work, that you can see through a permanent display of furniture, utensils and art objects. The entrance is quite expensive (around 10€), but it is totally worth! 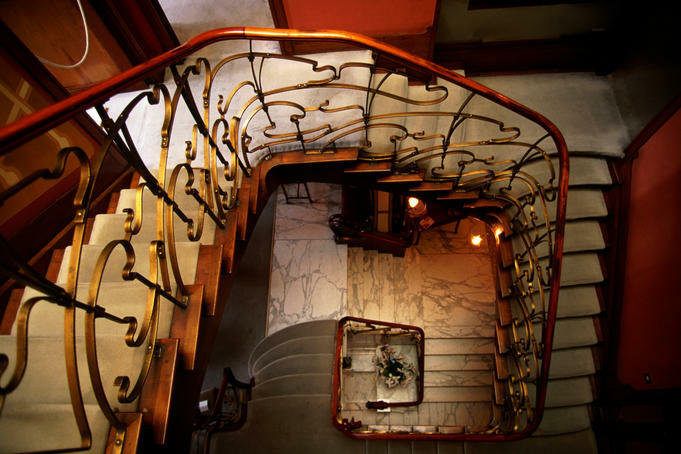 Once you finish your visit, the museum staff will provide you with a very small map showing all the Art Nouveau buildings in that area that you can easily visit, it is a very charming tour and it will not take you longtime. 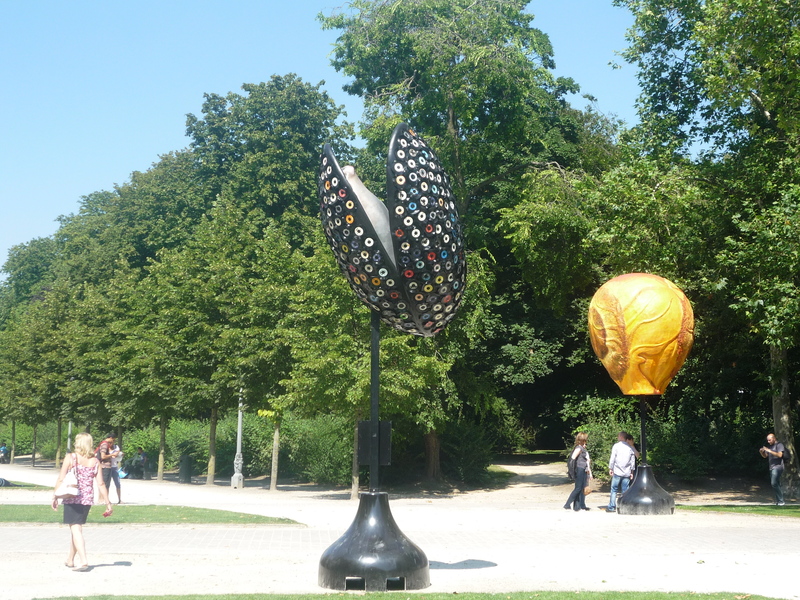 From Horta Museum, you can go back to the beginning of Avenue Louise, take Rue Royale and go back to Mont des Arts, the museum area that you passed on day 2. Now you can take your time and visit one (or even more) of the museums over there. My favorite one is the Musical Instruments Museum, but the Magritte one is also remarkable…up to you! 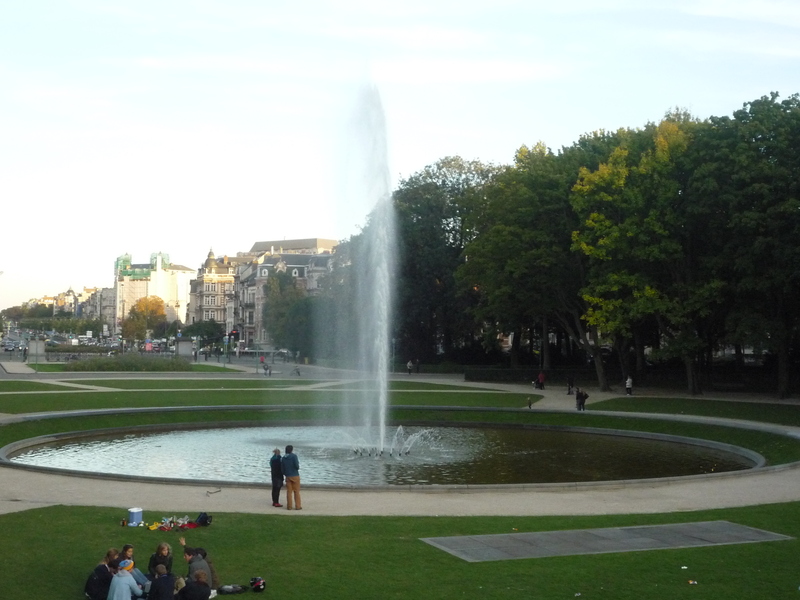 Once you finish in Mont des Arts, take rue de Namur, and after few minutes you will get to Porte de Namur area. There is nothing historical to see there, but for me it’s one of the most special neighborhoods in the city, since house of Matonge, the African district. 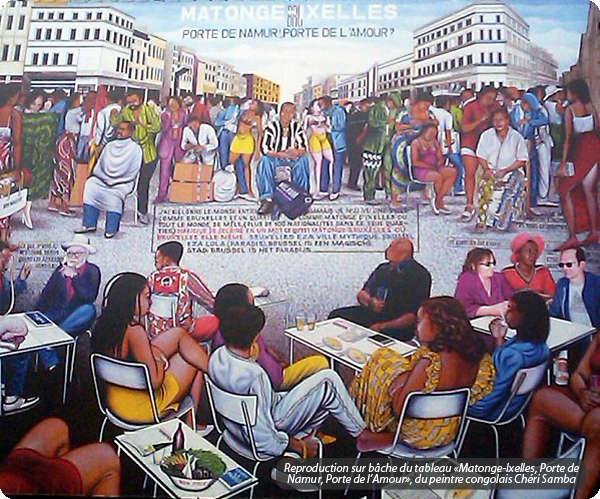 If you have a walk there you will find plenty of African (mainly Congolese) shops, restaurants, cafes…and if you’re lucky you may also run into a street concert of purely African music. Sometimes it might look a little bit old or dirty, but it’s a colorful and vibrant street that you may like visiting. If you are around Matonge area in the evening, you may also have dinner over there. You can in fact find many restaurants from every corner of the world (African, Italian, Greek, Japanese, Lebanese, Thai, etc), very good and affordable. If you want to continue the night somewhere else, you can take Chaussée d’Ixelles, keep walking for 10mins and then arrive at Place Flagey. This is one of my favorite spots of the city: not touristic at all but plenty of facilities around (shops, restaurants, bars and a wonderful lake on one side). The square hosts a very nice market on Saturdays and Sundays morning, and in the night it’s a meeting place for many young people. If you have an extra day to spend in Brussels, there are a lot of activities that you can do, according to your preferences. 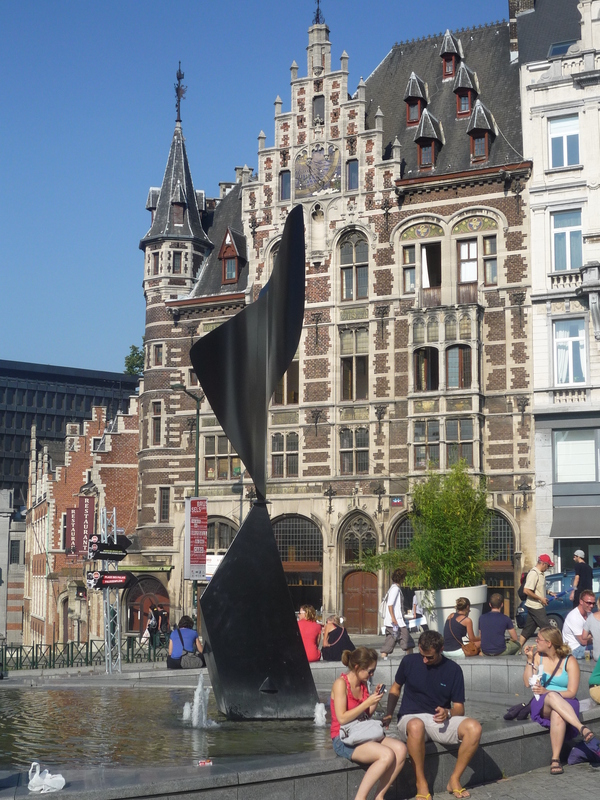 You can take the train and explore any nearby city in Wallonia or Flanders, for instance Antwerp, Bruges, Gent, Namur, Leuven. 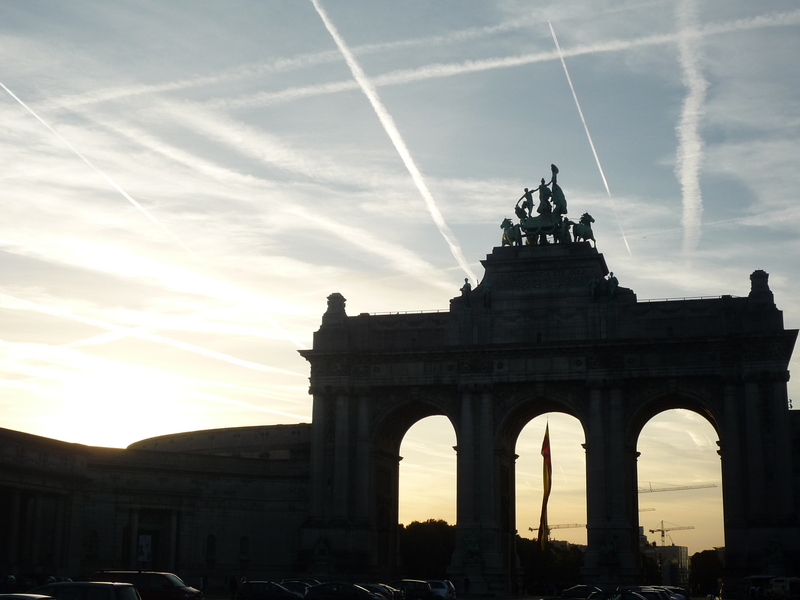 If you love nature, Brussels is the place to be. 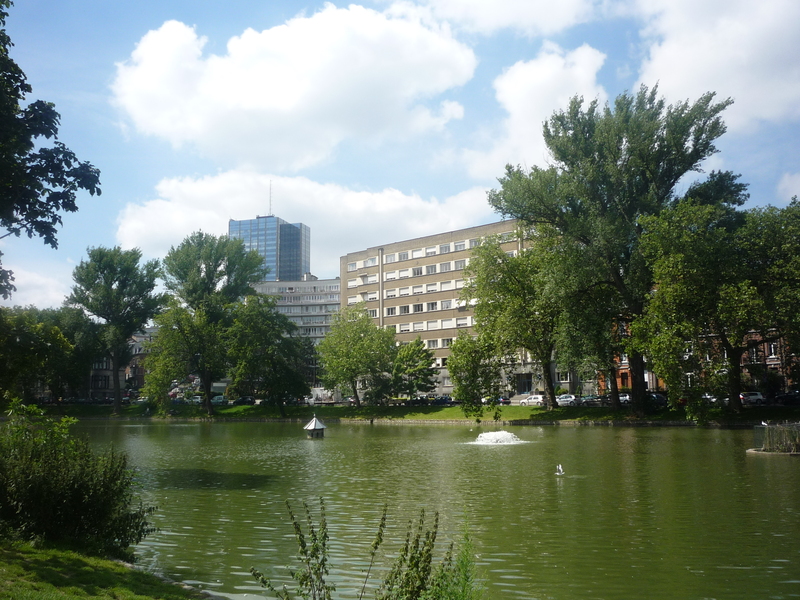 As previously said, the city is one of the greenest ones in the world thanks to its numerous parks located everywhere. 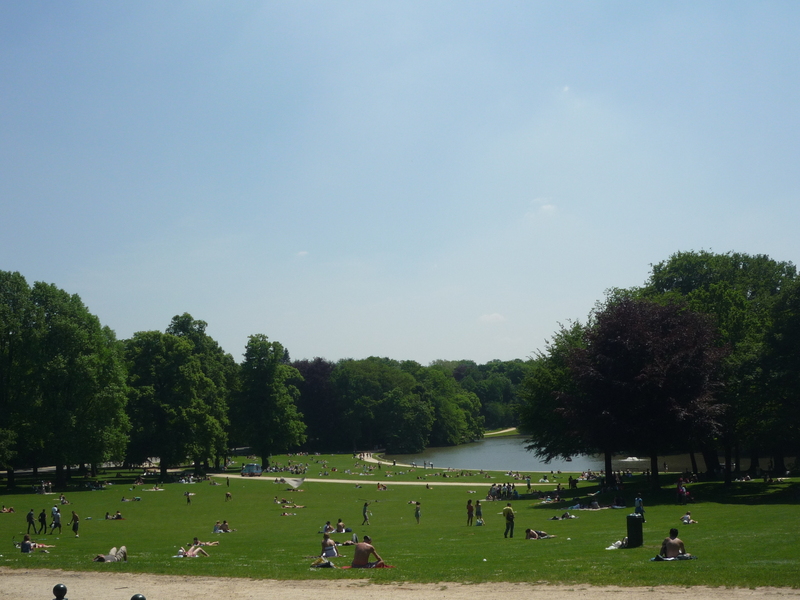 There is plenty of greenery that you can enjoy, but the best is probably Bois de la Cambre, a vast forest that starts from the end of Avenue Louise and finishes outside the city. You can do plenty of activities over there: walking, having a picnic near the lakes, riding a bicycle (you can even rent one in one of the several Villo bike points in the city), horse-riding and going by motorbike. 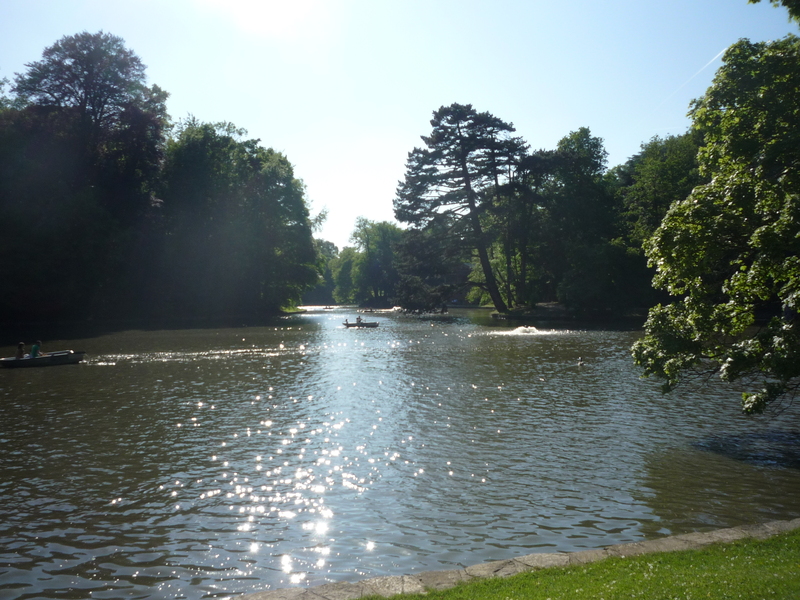 Especially if the weather is great, having some time in Bois de la Cambre can be a simple pleasure. 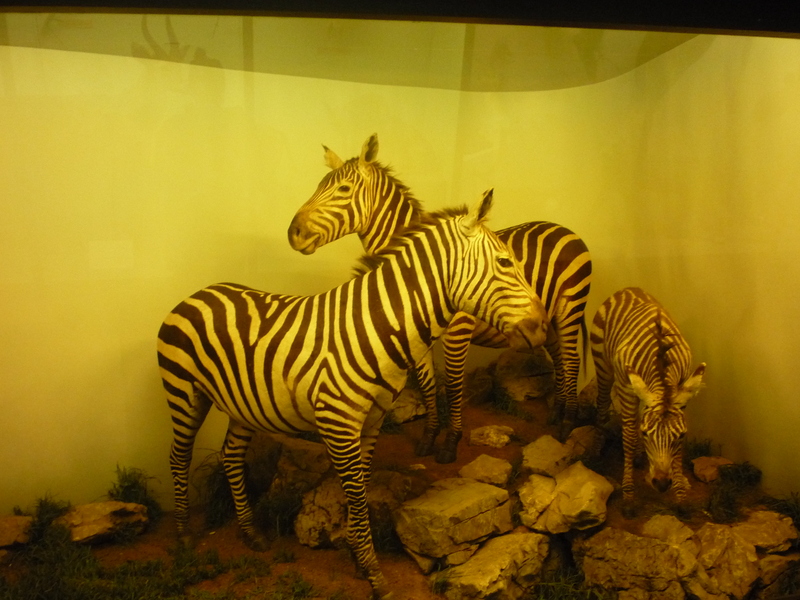 If you want to continue the explorations of the many museums they city can offer, besides the ones mentioned above, I would suggest 2 of them: the Comic Strips museum and the Royal Museum of Central Africa. The first one, located just next to the Central Station, includes a range of permanent exhibitions, illustrated with original artwork and unique objects, all representing the main Belgian creations in the world of comic strips: Tintin, the Smurfs and many others. The museum is open everyday but Monday. 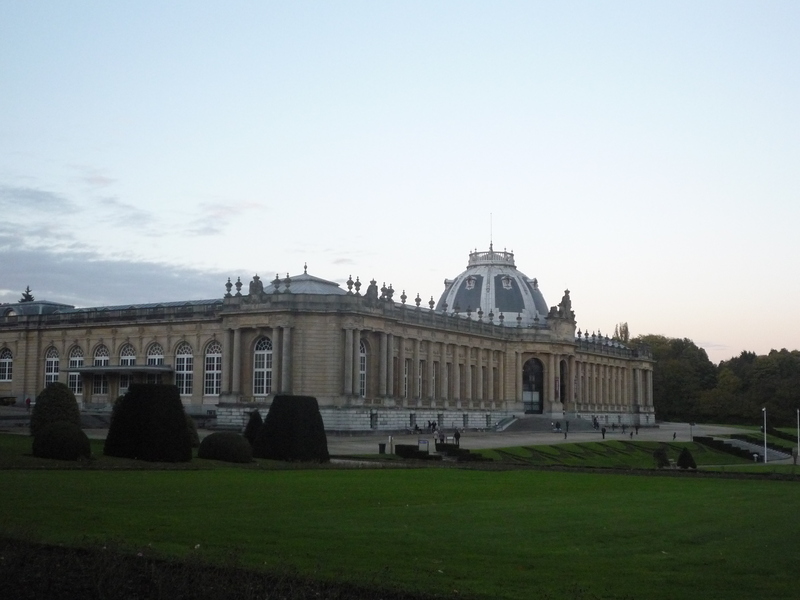 The second museum is definitely my favorite one: it is located in Tervuren, but easily reachable from Brussels by a tram 44 departing from Montgomery metro station (it is a very interesting journey, since this tram is passing through the forest). 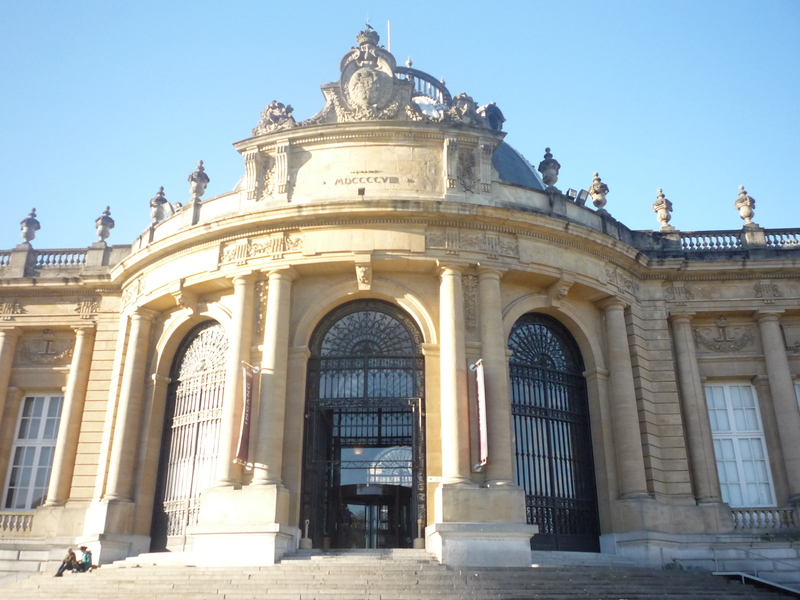 Located in a majestic and elegant building, surrounded by a wonderful park, the RMCA is an ethnographic and historical museum originally built to showcase King Leopold II’s Congo Free State for the 1897 World Expo. Inside you can admire clothes, weapons, animals and plants belonging to Congo. There is also a section retracing the entire history of the colonization and a section showing the natural wonders via the Congo river. Historically it can create a lot of controversy, but from the scientific point of view this museum is a true pearl that you cannot absolutely miss. It is open everyday but Monday.